What better way to start a dinner or create an entire lunch than with some soup? Soup is a good way to work a few servings of vegetables and health-supporting fiber into your diet. And you can do it without dairy! Although cream soups often are made with milk, cheese, and other dairy products, they don’t have to be. Properly prepared nondairy soups are thick, creamy, and hearty. The creaminess in these soups comes from nondairy milk or cheese substitutes as well as white potatoes and sweet potatoes, which each lend their thickening power without the help of dairy products. To add a creamy consistency to soups without using dairy products, purée about one-fourth of the batch of soup, including some veggies and broth, in a blender or food processor. Stir the puréed soup back into the larger batch and heat thoroughly. Adding beans, barley, rice, and small bits of pasta also thickens soups because these foods absorb some of the liquid. 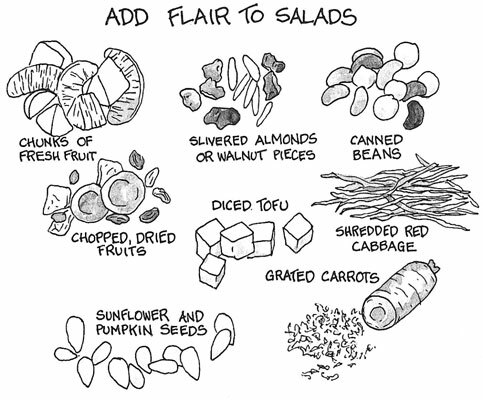 Salads are a great way to add some crunchy vegetables to your diet. They also have many uses. You can serve a scoop of salad with a sandwich as a nice side, or you can let a big bowl of greens stand alone as a light lunch. What’s even better: Salads are so versatile. If you have some fresh romaine or spinach, you can add different ingredients (all dairy-free to infuse a little excitement to an otherwise plain salad. Mayonnaise generally doesn’t contain dairy ingredients, but salads made with mayonnaise-based dressings sometimes contain milk added to thin the consistency of the dressing. If you go out to eat and order potato salad, tuna salad, carrot-raisin salad, or another salad made with a creamy dressing, ask whether dairy products were added. Although appetizers can set the tone for a meal and desserts can satisfy your sweet tooth, side dishes also are an important part to any meal. They round out your main dish. Even better, side dishes are a great way to add taste and comfort in smaller portions. A nondairy version of classic mashed potatoes and gravy is simple to make and indistinguishable in flavor from those made with cow’s milk. As for mac and cheese — you be the judge. Using soy cheddar-style cheese for its superior melt-ability is a good idea. Soy cheese may contain casein — check the ingredient label and pick a different cheese if you can’t or don’t want to eat casein. You can serve the dish as a side, but you’ll probably like this recipe well enough to make it the main dish.